El Muro offers tranquil views of the jungle,hearty food from our family style restaurant and a full service bar. If you like adventure we have a great rage of nice tours that you can book upon arrival. Our comfortable rooms boast private bathrooms with showers, ranging from six bed dorms to private suites. 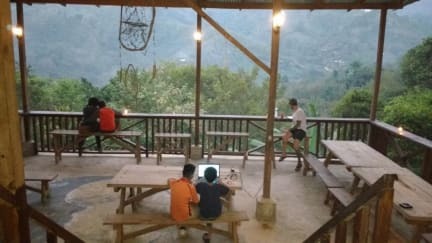 The covered terrace offers comfortable seating with a beautiful outlook on the valley (we have the best views in Lanquin) and is the perfect place to enjoy a drink with friends old and new. Happy hour is daily from 4pm - 8 pm, and you can connect to our 24 WiFi! El Muro is steps from the shuttle drop-off site providing the convenience of a bustling little town full of locals and tradition, make sure to check out the farmers market every Thursday and Monday. Te Gusta Fiesta? Our pub/bar is always happening, any night of the week and a favorite hang out for some of the locals! 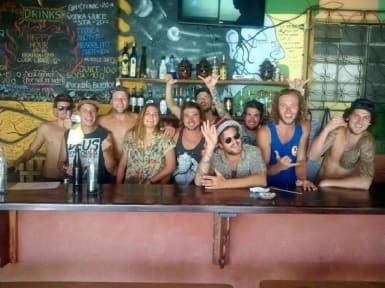 You will enjoy a 'fam jam' type of atmosphere in a relaxed and vibrant space where you can kick back in a hammock with a beer or get the party started with El Muro's famous 'giant jenga' drinking game. We are a group of outgoing, life-loving people who are excited to welcome you to the beautiful town of Lanquin! Payment upon arrival by cash, credit cards, debit cards. An extra 8% is added when using debit or credit cards. This property may pre-authorize your credit card before arrival. Breakfast not included but we have an awesome breakfast menu for our guests and breaky is served between 7 (ish) and 10 (ish) every morning. You can book tours and shuttle service directly through El Muro. Reception is open from 7:00 am until 10:00 pm. The bar is open from 3:00 pm until 11:00 pm.